Having good oral health means that you need to floss every day, but almost every option that we've found means that you have to be responsible for a certain amount of plastic waste, whether that's the use of picks with floss on them or those interdental brushes. And that's not good enough, sure they do the job but there is just so much waste invovled. So we found a solution, an attractive bottle containing a spool of waxed and flavoured silk that will do the flossing job beautifully, in a containter that won't cost the Earth - and it's refillable! Dental Lace Refillable Floss is the only fashionable refillable eco-friendly dental floss on the market today. Every time we sell one glass container, it replaces seven plastic containers. Each pretty little bottle comes loaded with one spool of floss ready to go and one spare, each are 30 yards long (which Google informs me is 27.43 metres, a fair bit in other words). Lightly minty and super pretty, what's not to like? By just chipping away at our reliance on plastic to house everything, we take tiny steps every day to reduce the amount of landfill we're responsible for and the waste we create. If you're going to fell good about yourself for flossing (your Dentist will be so impressed, I promise) then you might as well make sure you're not adding to a Global problem - have all the smugs why don't you? 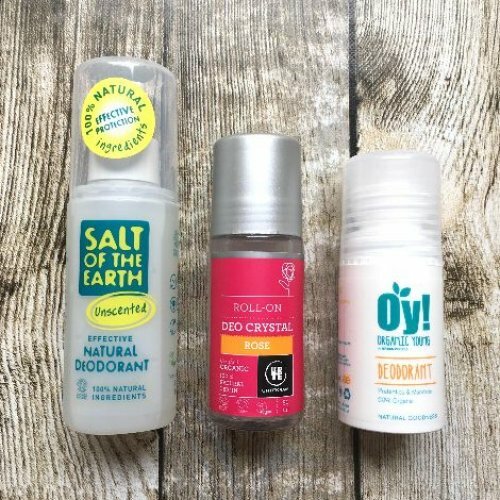 A selection of natural deodorants with different active ingredients.